As you may or may not know by now, I’ve moved from from Central IL to Northwestern Washington state. I’ve changed jobs, companies, and set my entire family on an adventure into the unknown, 2,100 mies away from friends, family, and everything we know. This wasn’t completely on a whim; the Pacific Northwest is the area of the country my wife and I decided we wanted to live permanently eventually; we just didn’t think it would happen this fast. But when the golden ticket arrives you can’t really say no. “Opportunity only knocks once”, as they say. We’ve been here 10 days and we’re not settled yet. We’re staying in a hotel while we wait for the closing date on our new house. Me, my wife, my son, my father-in-law, 3 cats, a dog, and a partridge in a pear tree for that matter. We’re starting to go stir crazy, but we can see the light at the end of the tunnel. When you’re displaced and already feeling isolated it’s incredibly hard to find comfort, to start to put down roots and make a new place truly home. Add it all up and even when it goes smoothly, The question can creep in. Was this really the right thing to do? A routine errand provided the answer in the most unexpected way. After work I decided to take my son and find the nearest “shared branch” bank that would allow me to transact using my account from back in IL. Even though it was only 5:30 in the evening Daylight Savings Time ensured that the sun had already been down for quite some time. 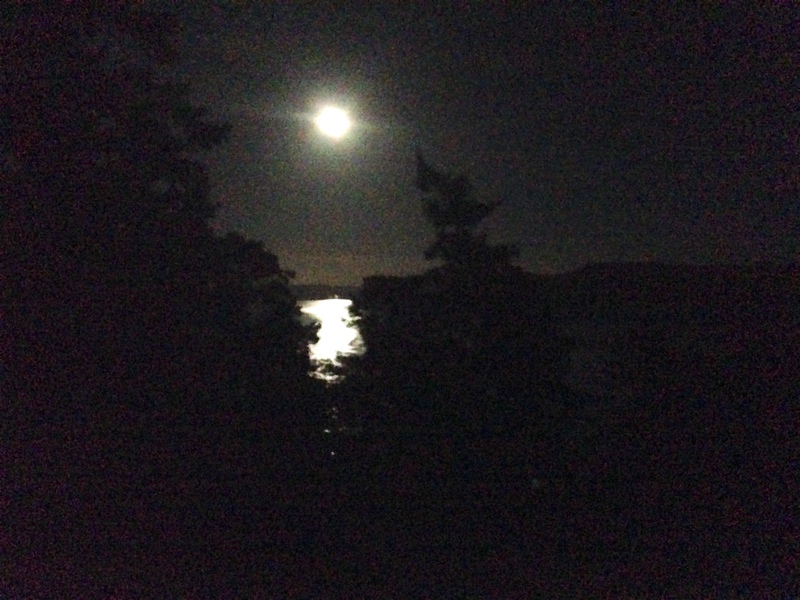 A full moon helped guide us on our trek as we headed for Oak Harbor. A small road (WA Route 20) with only 1 lane in both directions took us the entire way, winding through the trees and a few small towns. Suddenly the view opened up to Deception Pass. Even though it was completely dark, the moonlight gave way to a breathtaking view. I pulled over to the scenic waypoint, turned off the car, took my son out of his seat, and walked to the viewing area. We stood there, silently in awe, father and son, watching the full moon reflect over the eerily calm waters and pine trees of Deception Pass. Maybe it was the moonlight, maybe it was the slight chill in the air, maybe it was the stress release, or maybe it was that I was listening to the magically epic Z2 album from the Devin Townsend Project. Whatever it was, the significance of this moment hit me like an impact gun, nearly buckling my knees and practically moving me to tears. This is why we’re here. This is our purpose. The sense of adventure, of worldly exploration, of wonderment and deep humbling respect for Mother Nature. My iPhone can’t even come close to recapturing the moment. Yes, that is the moon. That sense had always been a part of me, but years of spirit-crushing winters and a job that drained the life out of me had left me wondering if it was gone forever. Tonight the fire was reignited and it’s starting to burn brighter and brighter. This fire will provide the strength I need to carry my family through this transition, to dig deep, find a home, and instill those same senses in my son and all the children I will have. I was born and raised in the Midwest and will be forever proud of that. But tonight Mother Nature opened her welcoming arms and reassured me that yes, my family belongs here. It would have been so much easier to just stay where you were, the job that you knew, the home that you had, the surroundings to which you had become accustomed. That was simply not enough. I know that feeling, and I’m so proud of you both for doing what you have done. The Gulf of Mexico was my defining moment of why I moved away from “home”. I drove to Peoria today and, like always, I thought of my dear friends when I took the exit onto southbound Knoxville Ave, off of Rt. 6. Today, I was so proud of you. I came home to see this. Now I KNOW I’m proud of you. I can’t wait to see what you saw, and so much more. See you in the Spring, my friends.